Appointed President of LAU’s Alumni Association worldwide in 2006 for two years and in 2008 elected for this post for a term of three years. 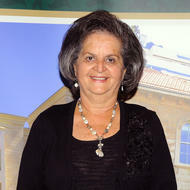 In 2011 Mrs. Dagher was reelected for a second term. Mrs. Dagher graduated from Beirut College for Women (BCW) in 1960. As a student, she was elected consecutively as freshman class President, Secretary of the Student Council, Vice President of the Student Council and as a senior, President of the Student Council. She was awarded the Sophomore Scroll, the Social Service Pin and the Torch which is the highest award given to a student. From the moment she graduated, she started working with the alumni. Mrs. Dagher was elected on the Executive Board of the Alumni Association several times where she served for many years. She helped Dr. Mary Sabri, former President of BCW, in fund raising and collecting memberships since this was the main function of the Alumni Office. In 1987, she was appointed Director of Relations and Admissions at LAU. Part of her job was with the alumni. She reactivated dormant alumni chapters such as: Damascus Chapter, Jordan Chapter, Kuwait Chapter, UAE (Northern and Eastern). She also established new ones such as Byblos Chapter, North Lebanon Chapter, Mount Lebanon Chapter, Bekaa Chapter, Oman Chapter, Qatar Chapter, Aleppo chapter, Saudi Arabia (Jeddah, Riyadh and Eastern Province), Bahrain and Abu Dhabi chapters. She also helped in modifying the constitution and by-laws of the Alumni Association in 2006. The other part of her job was student recruitment in Lebanon and abroad. Mrs. Dagher traveled abroad and met with a large number of alumni. They helped her schedule her school visits and get addresses of new alumni and she worked with them in planning their annual dinners, which she made sure to attend yearly. In 1995 she was appointed Director of Admissions and International Recruitment. She established the Parents’ Advisory Committee which main function was to assist the University in fundraising. Before she joined LAU as an employee, Mrs. Dagher was the Director of the National Protestant College. While there, she was contacted by one of her professors of Beirut College for Women and was advised to pursue her Masters Degree at AUB in a new major “Educational Administration”. From 1972-1976 she was a class teacher at ASG, which is the mother institution of LAU.